breakdown of refrigerators. Refrigerators run normally until they reach a certain level of accumulation. At some point, when they are over the limit, their performance drops quickly resulting in damage to, or disposal of the stored products inside. The Self-Cleaning Condenser device keeps the condenser clean and prevents system failure by automatically brushing daily. Digital temperature control & monitor system - Keep food products safe by maintaining constant temperatures. External digital display allows for easy monitoring. Hydrocarbon refrigerants (R-290) - With innovative and eco-friendly technology, Turbo Air brings you hydrocarbon refrigerators designed to meet the new standards of the EPA and DOE in 2017. Hydrocarbon refrigerants do not deplete the ozone layer and have very low contribution to global warming (ODP-0, GWP-3). 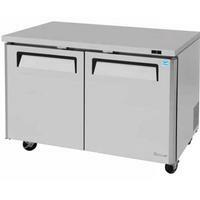 Stainless steel cabinet construction - The Turbo Air M3 model boasts a stainless steel exterior (galvanized steel back and bottom). Interior is stainless steel floor with AL sides and back. It guarantees the utmost in cleanliness and long product life. The M3 model adds a touch of style to the most refined setting.